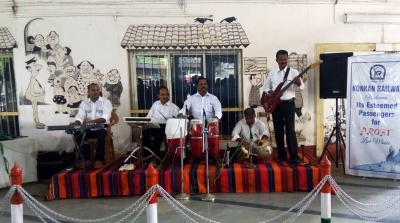 Goa News |Listen to live music at Madgao, India’s 1st Rly station in Goa! Listen to live music at Madgao, India’s 1st Rly station in Goa! Would you love to listen to live Goan music while waiting for your train to arrive? Enjoy this musical treat now at Madgao railway station, thanks to the initiative of the ‘musical staff’ of the Konkan Railway Corporation. “Our experiment was quite a success on Saturday and Sunday”, says Baban Ghatge, senior manager, public relations of the KRC. Rather than inviting a musical group, the KRC staffers, who are into music, got together as ‘Aarohi’ and decided to go ahead with the experiment. One hour before the Konkan Kanya left for Mumbai, at 5 pm, they started playing at the railway station and got cheers from the travellers. The KRC has now decided to throw it open for any group, who can come and play the live music at the railway station, one hour before any train departs. “Play for 45 minutes, share your talent with the passengers, entertain the people and stop 15 minutes before the train departs. That’s the condition,” says Ghatge. The KRC obviously does not pay any remuneration but provides the facilities like sound system and an opportunity to ‘market’ your talent to all kind of unknown travellers. Who knows? Tomorrow’s great musician could simply be picked up by a traveller from this free concert! The KRC has started it with Konkan Kanya in the evening, but the KRC is game for any train at any time, provided the musical group informs the authorities in advance and takes the slot. Ghatge has also provided his official email (click here) to contact and even to send your comments and suggestions on this unique initiative of the railway authorities. Great idea!!! Kudos to the Konkan Railway management for thinking out of the box. Ghatge Porbim tuka.